You are here: Home / Electrical Posts / What is the Ideal Color Temperature for Your Lighting? In this post, we’ll continue exploring color temperature for lighting, and how lighting design professionals determine what makes the most sense for a given space. There’s a lot more that goes into lighting design than picking a fixture that looks good! Some of this is also dictated by owner preference, manufacture recommendations, and standards from associated organizations. Ultimately, it is up to the lighting professional to use their judgement to decide when to step outside of these norms and do something different to better serve the space. For example, I was recently commissioned to design lighting for a Catholic Church renovation in Harrisburg, Pennsylvania. I specified the lighting as 3,500K color temperature, and was questioned by the manufacturer on my choice. After all, the “typical” specification for a space like this would be for 3,000K lighting. So why the higher color temperature – don’t we want a warm inviting space, not office lighting? Here were the variables evaluated during the design process. The median age of the parish members was established through conversations with church staff and personal observations (we did not conduct a formal statistical analysis). It was determined that the median age was approximately 50 years old. As we get older, normal aging occurs in our eyes (as well as the rest of our body). 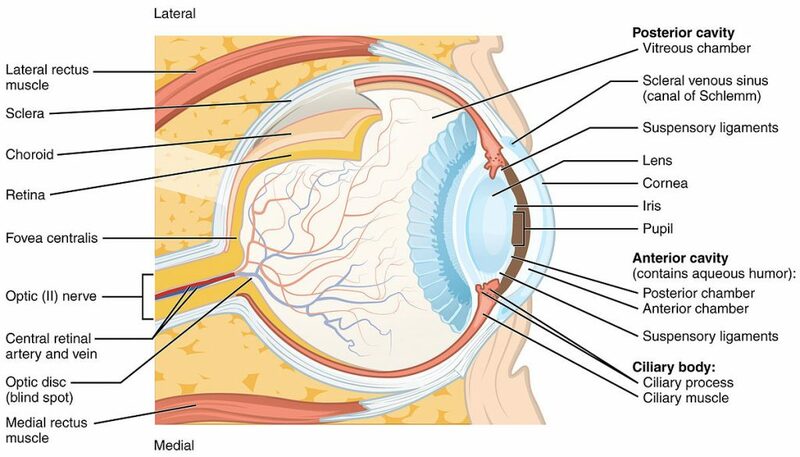 Part of the aging process entails the yellowing of crystalline structure in the lens of the eye (see diagram). This yellowing creates the effect of wearing yellow-tinted sunglass (of varying intensities). The aging process is gradual, so a person does not realize the change over time, just the slow degradation of sight. The yellow lens, also known as a luminous veil, is created because the changes in the lens structure start to absorb more blue light, making things appear yellow. This means that less blue light is transmitted through the eye. To compensate for this situation, we decided to increase the amount of blue light. By increasing the color temperature from 3000K to 3500K, we were able to strike a balance between the older and younger congregants. This church is unique in the amount and color of the stained glass. The church walls form an octagon, with seven of the eight walls covered in stained glass. 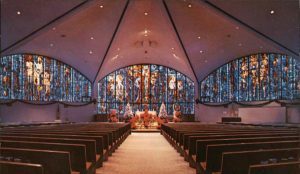 Six of the walls are approximately 65% stained glass, and the seventh wall, in the front of the building, is 90% covered. The stained glass is designed with a field of blue glass as the background, and various additional colors forming the image for that panel. This layout presented a challenge in that the natural light, which is already a high color temperature, continues to present itself as predominantly blue. In the first photo of the space, you can see the lower color temperature lighting that contrasted with the blueness of the stained glass. The client desired to create a better balance between the artificial lighting and the natural lighting. This was both in the quantity of illumination as well as the perceived look (color temperature). A higher temperature was chosen to balance this look. As you can see in the second picture, there is a better balance in color. It was also accomplished by increasing the total illumination and providing more light to the ceiling. 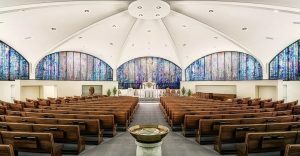 The church was designed in the 1970s and incorporated a modern architectural style, eschewing the traditional rectangular layout, incorporating parged concrete structures, and using stained glass as a primary feature. This look and feel lends itself to higher color temperatures. The whites and greys of the updated design work well with light that has a higher blue component. The whiter light also provides for an enhanced, uplifting experience. In summary, something as simple as color temperature can have a major effect on the look and feel of a space. Even though there are general rules of thumb for selection, these are only a starting point. An experienced lighting designer will need to decide if this “rule” makes sense for the space – or if the rule should be broken. Understating the interior design elements, such of paint, finishes, and millwork – along with the use or function of the space – all factor into making the best lighting decisions for the architecture as well as for the end-users. Questions about the quality and color of your lighting? Need help with a relighting project? Learn more about JDB Illumination or contact Craig G. Malesic, LC, PMP, EIT at 717-434-1558 or email him.